Spire introduced Kepler, a new series of budget processor heatsinks. 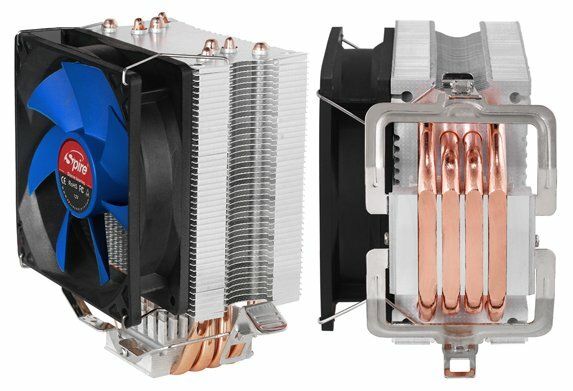 The basic Kepler cooler offers two direct-touch heatpipes and a heatsink with 45 aluminium fins. The Kepler II has three direct-touch heatpipes and 45 aluminum fins and the Kepler Pro edition offers four direct-touch heatpipes and 50 aluminium fins. All three models use a 92mm fan and come S420 thermal compound. Intel's Socket 775/1155/1156/1366 and AMD's Socket AM2/AM3 platforms are all supported. The Spire all new Kepler universal micro-processor cooler series are direct contact heat-pipe solutions for Core i3/i5 and i7 from Intel and the AMD AM2/3/FM1 micro-processors. There are three (3) different models ranging from two up to four 6mm sinter powder heat-pipes which are in direct contact with the cpu heat-source, dissipating heat effectively and fast. The high density fins are crowned with a powerful fan for high airflow and great cooling performance. The 92mm dc fan provides ample airflow and silent cooling at 19.0dBA. Compatibility is ensured with the multi-platform mounting clip for Intel 775/1155/1556 sockets and AM2/AM3/FM1 micro-processors. The Kepler series from Spire are build to deliver great cooling for maximum system performance.